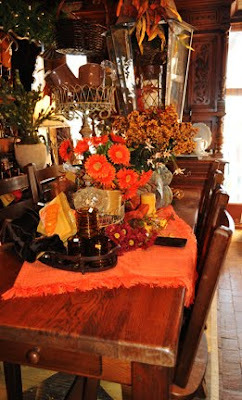 So someone has a secret hold on this French farmhouse table-I keep waiting for it to go to a good home. But here it sits and looks so beautiful-love the pumpkin orange chenille runner across the top of it-large lantern hanging over it. Hoping to have more French antiques arriving by November-cross your fingers! Maybe another farmhouse table if we can carry another one inside-they are heavy!